" An entertainmint center was made around the fire place. 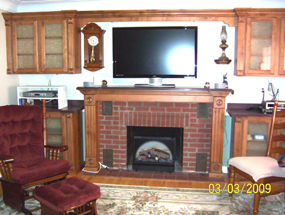 A mantle was installed around the existing hearth for the flat screen TV. And cabinets added with glass doors for the audio components. 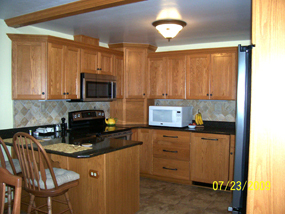 Custom pine cabinets with solid surface counters were used." © 2010 Doverspike Kitchens. All Rights Reserved. 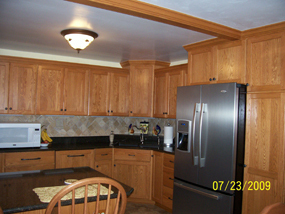 "Kitchen remodel: the wall between the kitchen and dinning room was removed, the client elected to have a fake beam placed in the old wall area rather than refinish both ceiling areas. A door and window were closed in and the kitchen layout completly changed. A new window was cut out in the dining area washing the room with natural light, canister lights were added and the entire kitchen rewired. 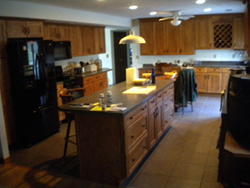 Custom oak cabinets with shaker doors, Quartz counter tops with ceramic tile splash area, and laminate flooring were used. 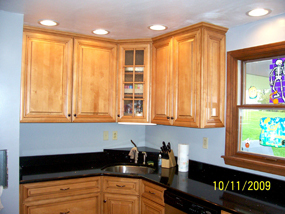 "Kitchen remodel: the wall between the kitchen and dinning room was removed, the entire ceiling was re-finished , canister lights were added, as well as under cabinet task lighting. 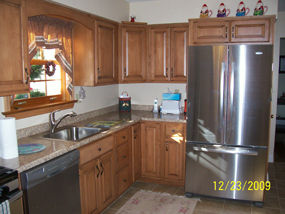 Maple cabinets with Quartz counter tops and under mount stainless bowl. Floating laminate flooring was installed and the walls and ceiling were painted. 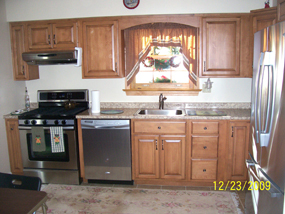 "Kitchen Remodel: Basic kitchen replacement, the dishwasher was the only addition to the old floor plan. 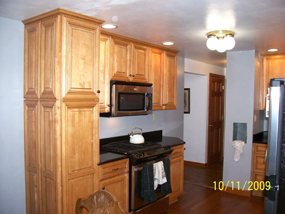 "Kitchen remodel: a wall was removed between the kitchen and dinning room doubling the size of the kitchen.the ceilings were re-done in the kitchen dinning room and living rooms. Canister & under cabinet task lighting were added, and the new kitchen area all rewired. An island was added as well as a desk and wine service area. 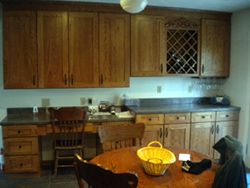 Oak cabinets with shaker door style, and laminate counter tops were used."